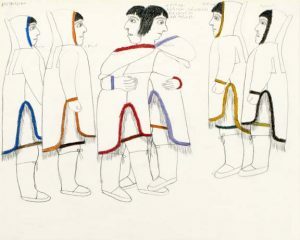 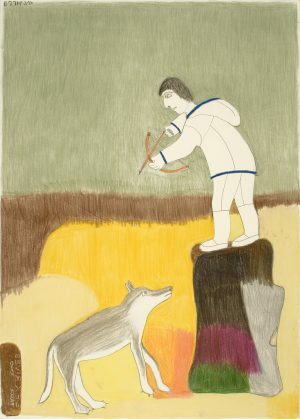 Kigusiuq’s drawing style changed over the years from the early linear, narrative images with only isolated colour accents to vibrant colour field images celebrating the Arctic landscape. 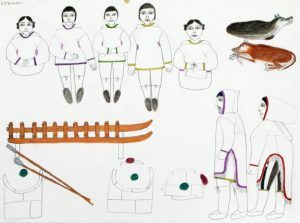 Her subject matter primarily harkened back to the traditional life she lived until settling in Qamani’tuaq (Baker Lake). 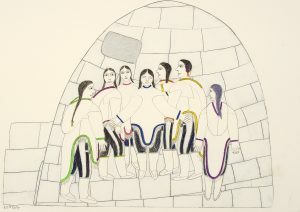 Traditional material and social culture provided imagery, as did myths and legends. 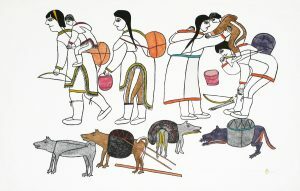 These themes are echoed in her beautifully appliquéd and embroidered wall-hangings. 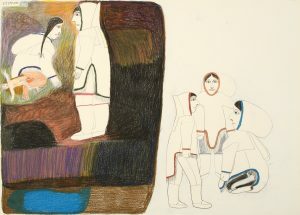 In the last decade of her life, Kigusiuq began to create collages that are reminiscent of her later drawings with their brightly-coloured imagery.